These chemistry jokes are for those who enjoy intellectual humor. Below is a collection of chemistry jokes, puns, riddles, and one-liners, so have fun expanding curiosity of the wonderful world of chemistry through humor. 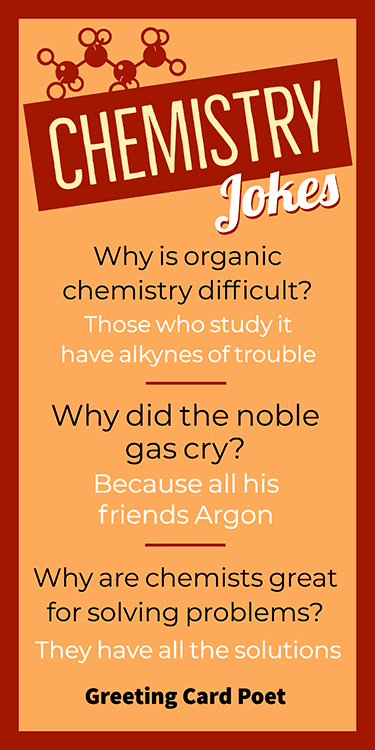 They’re really cheesy and may only have the power to make a chemist laugh, but worry not because we’ve included an answer below each joke so, at least you’ll understand their cheesy humor. Who knows, you may even learn something along the way! 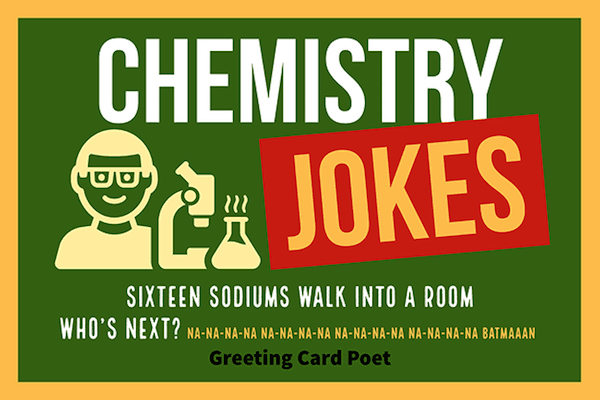 Embrace your inner geek with these chemistry jokes and share some of these jokes with your labmates or other chem enthusiasts to get the reaction you’re looking for. Take a look below! Why did the employer force his employees to walk between high-voltage plates before entering the workplace? Because he didn’t want any unionized workers. How do you make a 24-molar solution? Put your artificial teeth in water. Old color chemists never dye. A biologist and a physicist got married but they soon got divorced. There was just no chemistry. What did the chemist snack on during lunch? What did the thermometer say to the graduated cylinder? How many physical chemists does it take to change a light bulb? Only one, but he’ll change it three times, plot a straight line through the data, and then extrapolate to zero concentration. What happens when spectroscopists are idle? They turn from notating nuclear spins to notating unclear puns. How many physical chemists does it take to wash a beaker? None, that’s what organic chemists are for. What is a chemist’s favorite kind of tree? Why do chemistry professors like to teach about ammonia? To become a buffer solution. Why did the chemist sole and heel his shoes with silicone rubber? To reduce his carbon footprint. What did you do with Element 43 last night? What do you call a clown who’s in jail? How can you spot a chemist in the restroom? They wash their hands before they go. What emotional disorder does a gas chromatograph suffer from? What did the Mass Spectrometer say to the Gas Chromatograph? Our jokes and humor for kids page has some knee slappers you might like. Sixteen sodiums walk into a room. Who’s next? NA-NA-NA-NA NA-NA-NA-NA NA-NA-NA-NA NA-NA-NA-NA BATMAAAN. Have you heard the one about the sick chemist? If you can’t Helium and you can’t Curium, you’ll probably have to Barium. How do Sulfur and Oxygen communicate? What element is derived from a Norse god? What two elements do sheep yell out when happy? What is the chemical formula for “coffee”? What is the TV show that cesium and iodine love watching together? What is the chemical formula for “banana”? Anyone know any jokes about sodium? Why are chemists great for solving problems? They have all the solutions. Why did Carbon marry Hydrogen? They bonded well from the minute they met. How did Oxygen’s second date with Potassium go? Did you hear about the chemist who was reading a book about Helium? He just couldn’t put it down. Why is organic chemistry difficult? Those who study it have alkynes of trouble. What is the most important rule in chemistry? Because it’s in the ground state. How did the blonde define hydrophobic on her chemistry exam? What happens to nitrogen when there’s sunlight? They’re cheaper than day rates. What did one titration say to the other? Why does formic acid neutralize all other acids? What kind of ghosts haunt chemistry faculties? Why shouldn’t you trust atoms? Because they make up everything. What do you get if you swap the carbon atoms in a benzene ring for iron atoms? You get a ferrous wheel. You’d think that atoms bonding with other atoms would mean they’re being friendly, but really they steal each other’s electrons.